well, they give a few reasons which suggest they lean toward an african origin. but my confidence about my own position is modest at best. Also this time Italy seems to be the center (like for R1b1* etc. ), but the origin is always elsewhere. And why Western Asia that is very peripheral for this marker? I'm with Razib for once: it can hardly be explained among the mbuti of all African peoples if it did not exist in Africa prior to the OoA. It would therefore be one of the many markers, rare in the ancestral African genetic pool, that got a random founder effects in various Eurasian populations. There are lots like that. However I don't agree with Razib that it looks "Neolithic" in Europe. Too high in the SW and Britain and too low in Central Europe (where it ought to have been more of demic replacement at Neolithic by all accounts than in the Med/Atlantic). I bet that he Mbuti got it from their neighbors, perhaps a group from further north that they absdorbed. There are too few tested populations for a global study like this. Genetic scientists generally refrain from satisfactory amount and variety of sampling and testing. Is it mainly because of high costs? And are there other important factors as well (like bureaucratic, political and/or ideolological obstacles of some countries, and like obstacles (patent-related or not) of some companies)? If I see clear, it seems epicenter is in Mediteranium see. And, since the the estimation of age is so inaccurate, it could be true. What the study guess is that time was during the last glacial. And during that period I think land was shaped rather different than today and I quess see level was in some periods quite below today. Is there a reason why it cant be in what-is-today see? @onur: yap, guess costs, laws and special socio-political situations are obstacles for genetic sampling in some cases. It's easier and cheaper to work with previously existent databases than go and get the data yourself. Places like Burma seem like a no-no for geneticists to work for political reasons, even if they might be very interesting from the viewpoint of population genetics. In other cases, like the often mentioned French case it seems mere negligence. "And during that period I think land was shaped rather different than today and I quess see level was in some periods quite below today. Is there a reason why it cant be in what-is-today see?" I can barely understand what you mean but in any case lower sea levels did not ever cause Africa and Europe to be joined. The pattern seems (to my eyes) similar to other markers with a South Asian origin and greater frequencies in West Eurasia, so I'd say that it's spread seems to belong to the colonization of West Eurasia from South Asia some 50-40 Ka ago. My take on it would be that it is South West Asia, and from there expanded into Europe and Africa. 2. Next crop farming, spread by E1b1b, and spreading into the Sahel, where they are halted by climate for a few thousand years, till they exchange some of their crops for more tropical ones, and spread on again as the Bantu Expansion. So this would explain the current distribution nicely, and concords well with the evidence. Let's see Conroy: you have to take in account the real archaeology: Neolithic is not earlier in the Basque Country (the peak population, btw) than in, say Czechoslovakia, nor there are greater indications of colonization in Spain than in Germany, Britain or Poland. Actually it's the other way around. Also, why you may be correct about bovine cattle mostly going along the north route, pigs, cereals and legumes are known in Cardium/Epicardial Pottery neolithic, as well as high seas fishing and, at least in Iberia, olive too. Your description of the process in Africa is IMO also wrong: Afroasiatic languages spread surely with Capsian culture (Epipaleolithic) and then this culture was Neolithized by cultural flow (Capsian Neolithic) with a handful of Cardium pottery colonies at the coasts. I'm not sure about West Africa but I think that there is a spread of Agriculture into the jungle areas before Bantu expansion, giving origin to the Bronze Age civilization of Nok as maybe their most notable representative. Also there's (Nilotic?) herder expansion through East Africa, whose influence extended to Southern Africa too (Khoikhoi used to be pastoralists and that's before Bantu arrival) Bantu expansion is Iron Age agriculturalist expansion into ill-populated Paleolithic areas but once they reached more densely populated East Africa they seem to have absorbed a pre-existent population. So, meh, you sound like Balaresque: oversimplifying "Neolithic FTW" because it either has a Mediterranean distribution or a Central European, or an Atlantic one or an Eastern European or an Indian or an African one... all is "Neolithic". Remember that Europe and North Africa were colonized from West Asia around 40,000 years ago and that West Asia itself was colonized from South Asia only slightly earlier. And well, let's face it, Basque can't be more "Neolithic" than Catalans because all the Neolithic influences into the Basque Country arrived from the area of Catalunya. So if something is more common among Basques than among Catalans, then it just can't be Neolithic. Just the same that if something is more common among Mozambicans than among Gabonese, then it is probably not Bantu. And that if something is more common among Iroquois than among white New Yorkers, then it's surely not European. Sure, it might be a founder effect, but the chances are that not, so you have to PROVE it with some deeper research. I think that West Asians/Middle Easterners took the fast boat Coastal Route and got to Iberia, Brittany, Ireland, England, Holland and Denmark, and somewhere in the Holland/Denamrk area they encountered their cousins who took the Continental Route. Holland has the highest diversity of R1b1b2 AFAIK, and we see mtDNA T and J in Denmark - so I attribute these to the Coastal Route. Also, there are many way to skin a cat! We don't know where the Basques originated, but recent evidence suggests the Western Caucusus ultimately, and proximately from Western France or Aquitane in particular. So your claims about Catalyuna don't have much bearing on this question. In regards to R1b, I have already discussed that a Neolithic scenario is plainly impossible because there is only one star-like explosion and this took place in West or Central Europe (R1b1b2a1) and not West Asia (R1b1b2* and R1b1b2*) nor the Balcans (too rare). Also it's plainly absurd that this lineage became overwhelmingly dominant not in one but several unrelated Far West populations known precisely for their relative isolation. The Neolithic flows must therefore be associated to other Y-DNA lineages such as E1b1b1, J2b, G2a, T and such. "We don't know where the Basques originated, but recent evidence suggests the Western Caucusus ultimately, and proximately from Western France or Aquitane in particular. So your claims about Catalyuna don't have much bearing on this question". Let's see: the Western Caucasus thing seems to be plainly wrong but the Aquitaine one is surely correct. But I'm not talking about "origin of Basques" but about Neolithic inflows. And, archaeologically speaking, the Neolithic inflows into both Aquitaine and the Basque Country came essentially from the area of Paisos Catalans (along the Ebro river) and Languedoc (along the Garonne river) which is the Catalan area roughly speaking. So if something is higher among Basques than Catalans (and their close cousins: Valencians and Languedocines), then it's most likely not Neolithic. (Notice that this not means that the opposite is true automatically because Catalan Neolithic shows low colonization index in the archaeological record, just as most Cardium Pottery does, just that has infinitely better chances to be correct). Maju: The pattern seems (to my eyes) similar to other markers with a South Asian origin and greater frequencies in West Eurasia, so I'd say that it's spread seems to belong to the colonization of West Eurasia from South Asia some 50-40 Ka ago. Makes sense to me - the distribution looks very archaic. Hard to tell though where and when the mutation arose: it could have been carried as a rare incidence by a member of the early migrations into Europe, or perhaps could have arisen there very early on. The frequency is very low east of the Black Sea (low enough to be imported there during IE/historic back migrations), so it seems clear that if this mutation already existed in south or west Asia, it would have had to be extremely rare as to basically die out. Another thing I would like to add is that these types of studies will eventually falsify replacement theories. If it can be shown that such mutations are old, and if they follow patterns like this one, where we basically see a diffusion, and no sign of any of the known, characteristic migrations (and yes, I know, the figure is misleading because it has way too much resolution considering the paucity of data points) - then replacement rarely happens. Why do you make any association of this marker with Y-DNA, Eurologist? Y-DNA lineages are in most cases probably correlated with only a rather small fraction of the overall genetic pool. At least that seems to be the case in most populations. 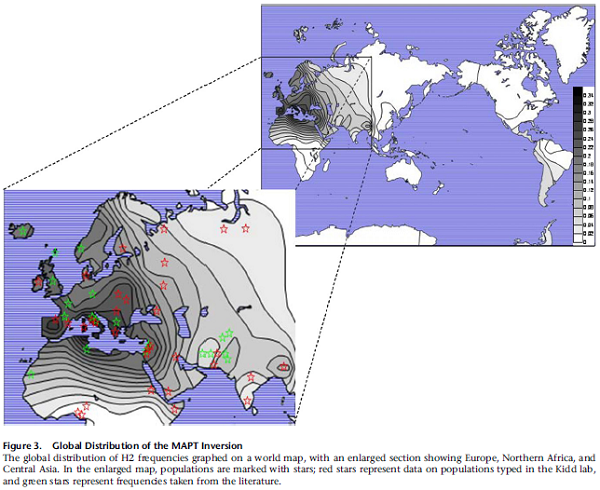 I don't see any clear correlation of this marker with any haploid lineages, excepting to some extent a general correlation with the demic flow described by them all (taken together) from South Asia to West Eurasia and, in Europe, with different routes and gradients through the southern central and east European cultural dispersal routes, routes that are more or less attested (or implicit) since the Palolithic. You may mean specifically the relatively sharp gradient at the Balcan/East Europe border but that specific "bump" of density might well be a case of Neolithic flow from the southern Balcans. More surprising to me is the relatively low levels of this marker in Germanic Europe (but not Britain nor Norway), i.e. the "bump" in the opposite southwards direction. It may be a matter of founder effects of some sort though. Not just y-DNA - I mentioned IE and Slavic expansion. In all of those terms, eastern Europe and the immediately adjacent West Asia are relatively homogeneous - whereas here you have a strong, essentially east-west gradient of five contour levels from the Baltic to the Black Sea. Yes, the "hump" north of the Balkans could be either neolithic or Slavic expansion. But it all seems to point to a pool of this mutation mostly south of the Alps, and a different population north and north-east that perhaps was initially free of it. "But it all seems to point to a pool of this mutation mostly south of the Alps"
Why precisely south of the Alps (in Italy) and not in Greece or the Basque Country? "... and a different population north and north-east that perhaps was initially free of it". Rather I imagine a penetration of people from Eastern Europe (relatively low in the deletion) into North Europe, causing the southern oriented wedge or bump. But it's a single marker anyhow, I would not make too much of it. Anyhow, one thing is curious, per the original post at GX, this inversion (H2) is in fact the ancestral one in the primate tree but is deemed to be derived among humans. I don't know what to make of it but it's possible that H1 never rose to total fixation among humans and that's why we find it at low levels in Africa and, as founder effect, in Eurasia. Another possibility is that the site is highly unstable and is reverting more often than thought. I meant across Europe, as more accurately in: "at latitudes south of the Alps." The only way for old genetic traits to remain highly organized, and not be diffuse, is if there wasn't common significant population movements. If polpulation movement is common then an old genetic traits whether originally exhibiting spatial organization or not will become diffuse. You will see highly organized distribution payterns of genetic traits after few migrations of a new genetic trait but not many. The Mbuti are admixed with "Caucasoid"? Oh comon Dienekes, your Med nationalism might be getting the better of you here, again. Do you really want these Pygmies classified as being part Med like Ethiopians? Just because the 13,600 to 108,400 years estimate makes it possible that Meds are heavily mixed with some pre-Neolithic African element..
"The Mbuti are admixed with "Caucasoid"?" They probably are. According to some data in my possession, even representatives of Y-DNA haplogroup R1b have been found in at least two pygmy tribes in two different countries of western Central Africa. The Mbuti are admixed with "Caucasoid"? "They probably are. According to some data in my possession, even representatives of Y-DNA haplogroup R1b have been found in at least two pygmy tribes in two different countries of western Central Africa"
R1b1a in most subclades is Central African, not "Caucasoid". The Mbuti are not from Western Central Africa but from the Ituri forest, towards the East. @Ren: even when you are right, you manage to be wrong by going personal. "R1b1a in most subclades is Central African, not "Caucasoid"." Are you suggesting that haplogroup R1b is not of recent Eurasian origin in its entirety? "The Mbuti are not from Western Central Africa but from the Ituri forest, towards the East." That makes it even more likely that the Mbuti should have Caucasoid admixture, since they are in closer proximity to some heavily Caucasoid-admixed Semitic, Cushitic, and Nilotic peoples of East Africa. Please keep in mind that the various pygmy groups speak the languages of their taller neighbors, so there is no linguistic barrier to prevent geneflow from a hypothetically Caucasoid-admixed Central Sudanic-speaking population (Lese) to the Mbuti, for example. "Are you suggesting that haplogroup R1b is not of recent Western Eurasian origin in its entirety?" "Recent"? Probably not. It seems quite old to me. 30 or 40 Ka ago is not "recent". Calling R1b "Caucasoid" is like saying that E1b1b is "Negroid": meaningless. "And yet you insist that a majority of European R1b1b2 is of Paleolithic "proto-Basque" origin in the Franco-Cantabrian refugium". How can this contradict the previous? If you see it in terms of "races", who knows? But the center of R1b in Africa is south of Lake Chad, much closer to Western Pygmies than to the Mbuti. So I doubt that the Mbuti have R1b in their gene pool. I also think that the erratics you mention of R1b among Western Pygmies are not of any Caucasoid origin but of Chadic (Negroid) origin. ""Recent"? Probably not. It seems quite old to me. 30 or 40 Ka ago is not "recent". Calling R1b "Caucasoid" is like saying that E1b1b is "Negroid": meaningless." You have no basis but your own prejudiced zeal for the hypothesis of an almost "pristinely Palaeolithic" Franco-Cantabrian origin of the Basque gene pool to support your claim that haplogroup R1b is 30,000 or 40,000 years old. If R1b were really so old, don't you think we should expect to see greater morphological and autosomal genetic differentiation between modern populations that are mainly R1b (e.g. Dutch people) and those that are mainly R1a (e.g. Polish people)? In reality, most ethnic groups that have mostly R1a or R1b Y-DNA are morphologically, autosomally, and even linguistically homogeneous. By the way, I do believe that haplogroup R1b is originally Western Eurasian, but I do not believe that haplogroup E1b1b is originally Western Eurasian or Sub-Saharan African. If anything, it is probably from some ancient South/East Eurasian population. "How can this contradict the previous?" How are you replying to text that should not have been posted for more than one minute? It is very strange. I wanted to avoid getting bogged down in an argument about the variance and phylogenetic origin of haplogroup R1b and how both suggest a recent Eurasian origin of this haplogroup despite the high frequency of R1b1a-V88 in some populations of the Sahel and northern Cameroon, but it looks like my effort has failed to achieve the desired effect. Suffice it to say that it is not parsimonious to suppose that R1b should be divided into one originally "Caucasoid" subclade that has developed in the Palaeolithic population of the Franco-Cantabrian refugium (as you are apt to claim) and another originally "Negroid" subclade that has developed in a Palaeolithic population of what is now the Sahara Desert or vicinity. "If you see it in terms of "races", who knows? But the center of R1b in Africa is south of Lake Chad, much closer to Western Pygmies than to the Mbuti. So I doubt that the Mbuti have R1b in their gene pool. I also think that the erratics you mention of R1b among Western Pygmies are not of any Caucasoid origin but of Chadic (Negroid) origin." I do not have any direct evidence of a presence of haplogroup R1b in the Mbuti or other pygmies of eastern Central Africa, but it is a fact that R1b has been found in pygmies of western Central Africa, which probably indicates recent geneflow into the pygmies of western Central Africa from neighboring Bantu populations. Of course, these Bantu populations may have acquired some R1b1a-V88 Y-DNA through geneflow from speakers of Chadic, Adamawa, Central Sudanic, or Saharan languages further north in Central Africa, but it does not change the fact that the presence of any sort of haplogroup R1b Y-DNA pretty much proves that there has been a certain degree of recent geneflow from (Western) Eurasia to Central Africa. "How are you replying to text that should not have been posted for more than one minute? It is very strange". Probably because I read the comments in my email account, so even if you delete, I get an email with the original message and, sure, I don't bother making sure if the message is still there or not (normally they are). "You have no basis but your own prejudiced zeal for the hypothesis of an almost "pristinely Palaeolithic" Franco-Cantabrian origin of the Basque gene pool to support your claim that haplogroup R1b is 30,000 or 40,000 years old". Well, I'm not sure if the origin (or R1b1b2a1 if anything) is at the FC region or in Central Europe but that's pretty irrelevant. It is beyond the scope of this discussion and I'd find very difficult to explain to you in a mere comment why I suspect that R1b1b2a1 should be Paleolithic (it has to do with star-like expansions and mtDNA H or H1) but what is clear is that the arrival of R1 leading to R1b as a whole to West Eurasia must have happened along with the main flow from South Asia in the 50-40 Ka window. Hence the R1b scatter into Europe and Africa should belong to the immediate pre-LGM window. "If R1b were really so old, don't you think we should expect to see greater morphological and autosomal genetic differentiation between modern populations that are mainly R1b (e.g. Dutch people) and those that are mainly R1a (e.g. Polish people)?" 1. It's Y-DNA and Y-DNA does not typically reflect but a minor apportion of ancestry. This is the main reason: the same that make Greek or Albanians or Moroccans look clearly West Eurasian in spite of being largely E1b1b1. The same that makes Chadic peoples from North Cameroon indistinct from their neighbors in spite of being largely R1b1a. 2. It's still possible that R1a coalesced in Europe or West/Central Asia. It is probably the case for its main subclade. 3. Polish and Dutch look very different to my eyes (even if autosomally they are more similar, it seems). Indians and Europeans do not look that different and are quite close autosomally speaking too. There's been some differentiation since 50 Ka ago but not that much. "In reality, most ethnic groups that have mostly R1a or R1b Y-DNA are morphologically, autosomally, and even linguistically homogeneous". That's over-simplistic. It's like saying that J1 is "Semitic" or "Arabic". It's not that simple because we know that there was very limited Semitic or Arabic demic flow into North Africa and still J1 is very high there. In fact it looks like of much older origin. Equating languages (which are lost and learnt) with genes (which persist through generations regardless of cultural or linguistic changes) is a waste of time - at least in most cases. Languages are all very recent (none has been tracked to before the Epipaleolithic) while haplogroups are in most cases much older. "By the way, I do believe that haplogroup R1b is originally Western Eurasian, but I do not believe that haplogroup E1b1b is originally Western Eurasian or Sub-Saharan African. If anything, it is probably from some ancient South/East Eurasian population." E1b1b? You must be kidding! E has a very clear African origin. In fact it's the representative of the C'D'E'F that did not left Africa and for some reason was swept to fixation in that population (F was swept to fixation in South Asia and C and D survived in the Eastern frontier only). E1b1b is very clearly of NW African origin (Sudan or nearby). "Suffice it to say that it is not parsimonious to suppose that R1b should be divided into one originally "Caucasoid" subclade that has developed in the Palaeolithic population of the Franco-Cantabrian refugium (as you are apt to claim) and another originally "Negroid" subclade that has developed in a Palaeolithic population of what is now the Sahara Desert or vicinity". For me haplogroups are color blind. You can be "white" and have Y-DNA A and you can be "black" and have Y-DNA Z. Phenotype is not defined by patrilineal ancestry, obviously. Much less after dozens of millennia. I insist that I am not sure how R1b1b2a1 was swept to fixation and expanded in star-like pattern (very fast) in Europe. It can be Magdalenian or Gravettian or even Aurignacian (but cannot be Neolithic because the pattern doesn't fit - much less Indoeuropean). Such sweeping to fixation can only have happened under very low population levels, i.e. before the post-LGM expansion (which was maybe more important than the Neolithic expansion, at least in proportion to what existed before). Also it's a lot easier to explain other R1b offshoots such as the ones in Central Africa and Central Asia if they expanded early on, in UP times, when population was low. Also, as P and R coalesced surely in South Asia (and possibly also R1) it's easier to explain their migration from South Asia in the general context of the colonization of West Eurasia. So all that gets us with R1b in West (Eur-)Asia c. 40 or at most 30 Ka ago. So it's not "recent". "but it does not change the fact that the presence of any sort of haplogroup R1b Y-DNA pretty much proves that there has been a certain degree of recent geneflow from (Western) Eurasia to Central Africa". What I say is that is is surely not "recent" at all. There has been some gene flow between West Eurasia and the Sahel... in both directions... but mostly it does not look recent. Btw, Ebizur, I have just made a long post on why R1b1b2a1 just cannot be Neolithic (hopefully the definitive reference so I don't have to explain again and again). I'd suggest further discussion on this matter to have it there. Up to you anyhow. Thanks, Maju, very nice write-up. I agree with most of it. Obviously, one of the main questions is at which level R migrated into West Asia and then into Europe, and with how many sub-groups (and which ones, exactly). I think it is easily explained (through the LGM population bottle-neck) why only few sub-sub-groups survived (and why R1a kind of mirrors this, in the East). The most serious criticism often promulgated is why R mutated so quickly down the ladder in perhaps as little as 10,000 to 20,000 year in Asia, and then a particular sub-group got the advantage perhaps 14,000 or 12,000 years ago (or earlier) and has changed little, after. Again, I don't think this is a serious problem. The initial population in Asia would have been huge, in comparison. I have pointed out before the likelihood of a different (from the South) population of humans in Northern India and Pakistan - separated from the South by huge deserts and uninhabitable zones. This would have been the collective, rich niche for both R1a and R1b just before the climate changed and migration to Europe (and overwhelming the indigenous Neanderthal population) became feasible. So, from the get-go, only a few of the deriving sub-groups of these would have participated and would have made it into Europe - where rather shortly after arrival conditions turned worse, and the total population number became rather small, again. And of what remained, only a few Y-lineages where the lucky ones to exponentially dominate the growth after LGM. "Thanks, Maju, very nice write-up. I agree with most of it". "The most serious criticism often promulgated is why R mutated so quickly down the ladder..."
It may be just that it's over-researched in comparison to other lineages... but only at the stem level. We know that very little work has been done to understand the downstream structure of R1b and in particular of R1b1b2a1. The number of SNPs can hence be just an illusion. "Again, I don't think this is a serious problem". Not necesarily. I have the impression (and have read some peer-reviewed references that seem to confirm it) that large haplogroups appear to mutate more slowly than small ones. This might be a mere effect of drift, as novel mutations would be mostly absorbed or kept at bay (i.e. as "private" lineages) in large populations (more mutations would happen but they'd have very limited effect). "I have pointed out before the likelihood of a different (from the South) population of humans in Northern India and Pakistan - separated from the South by huge deserts and uninhabitable zones". I am not aware of such barriers within South Asia. I'd agree that there would have been some (many?) different groups in such a huge subcontinent but I can't identify any single barrier. Even the Thar Desert is only a partial barrier. However I do identify at least two different scatter routes: the Narmada-Son-Ganges and the southern one. More in detail I could think of five different scatter routes: Indus river, along the eastern border of the Thar Desert, Narmada-Son-Lower Ganges, West Coast plus Krishna river and finally the purely coastal one. These distinct routes (as well as the E-W Ganges axis) could have provided for some differentiation patterns but the various populations would have also been able to remix. In contrast the Iranian deserts and the NE India hill-jungle country provide for low density buffers that would act as real barriers after the initial flows. While I can tentatively agree with a South Asian origin for R1a, R1b clearly coalesced already in West Eurasia. This migration leading to R1b happened at the R1 stage probably (assuming a SA homeland for R1a) or at the R stage (if R1a coalesced in West Eurasia after all). "So, from the get-go, only a few of the deriving sub-groups of these would have participated and would have made it into Europe - where rather shortly after arrival conditions turned worse, and the total population number became rather small, again. And of what remained, only a few Y-lineages where the lucky ones to exponentially dominate the growth after LGM". 1. The UP population of Europe appears to have been low all the way into the LGM. Only with the post-LGM expansion it shows clear signs of demographic explosion, whatever the reasons (see: Bocquet-Appel 2005). 2. What about mtDNA H? In order to have reached NW Africa in the Solutrean period (right in the LGM phase), which is the only reasonable possibility I can think of, it must have existed, not just as H but also as H1, H3, H4 and H7, already by that time. That makes its latest possible date to be the Gravettian expansion. But, considering the huge dimensions of the H star-like structure, only comparable to M, I am really tempted to consider the Aurignacian expansion (i.e. the original colonization of Europe by H. sapiens) as the real moment. Also, counting mutations from the root, I always come up with R0 and H being older than other WEA and Euro lineages respectively. There is the problem of the downstream mutation count but I have commented on that issue above. The paleoclimate data/maps I have seen show that much of India was semi-desert with few or no trees for much of the time ~100,000 to ~15,000 years ago, except for the very south and south-east (maintaining rain forest) and a fairly narrow strip south of the Himalayas (which would have at least provided fertile river valleys). So, humans would have been able to migrate up the Indus river valley and the Ganges river, but not much in between. My bet is that by the time these two populations met again some place south of the Himalayas, the former group would have developed an advantage in having already adapted to the cooler, dryer climate and appropriate survival and hunting methods. At any rate, I see a good possibility of a northern Indian (and stretching into nowadays Pakistan and Afghanistan) population that would have been somewhat isolated from the south and east and perhaps, over 10,000 to 20,000 years or so, developed some of the "Caucasian" characteristics that are common from India to NW Europe. In other words, you don't only have to rely on later back migrations to explain some of the Indian phenotypes and Haplogroup idiosyncrasies. I haven't ever seen such thing. For example I have this reference, which shows that South Asia was essentially savanna/grassland or forest, depending on the period. However, based on mtDNA distribution and archaeological data, I suspect that the Central-East (from inner Maharastra to Orissa) was scarcely populated or was colonized mostly in a relatively late date, being maybe a quasi-barrier of some sort (dense jungle?) but almost for sure permeable by the coastal routes anyhow, specially the Western one. Similarly the Thar Desert may have been a partial barrier between the Indus and Northern India (but again permeable north and south of it). "In other words, you don't only have to rely on later back migrations to explain some of the Indian phenotypes and Haplogroup idiosyncrasies". I agree with that. However I would rather think of a phenotype continuum through southern Asia that we could well call "proto-Australo-Caucasoid". Sincerely I fail to see a clear divide between these two categories, specially when the term "Australoid" is used in a classical but utterly ambiguous sense, including all kind of "archaic-looking" morphotypes that do not fit into the usual two main categories of "Caucasoid" and "Mongoloid" (i.e. including Ainu, many South Asians, Papuans, Negritos, etc., as well as most fossil skulls). I think that all these variants are related but in a very ancestral sense, i.e. : the morphotype would be typical of early Eurasians in general and what we see are local variants of it, most of which are very localized. Truly large, expanding populations were likely impossible before ~55,000 years ago, although migration to the north along the two main rivers would have been feasible. The data suggest that AMHs after that would have been able to thrive in India for roughly 10,000 years before wetter conditions extended grass lands to the west (~50,000 to 45,000), and treks to Europe became feasible. India and adjacent regions then would have been a pool for people expanding and moving west (and east) for another twenty millennia of favorable conditions - a time frame that coincides with known migrations into and newly-evolving cultures in Europe. Then again, for ~15,000 years around LGM, the North would have been essentially cut off from the south. "The two periods of weakened monsoon are consistent with other paleoclimatic data from India and may represent widespread aridity on the Indian subcontinent during isotope stages 2 and 4." There are some much newer pollen studies that I have to try and find again. "Conversely, 25,000–60,000-yr-old calcretes (eolian units II and III) probably formed under monsoonal conditions." So in that period South Asia had a climate somewhat like today. Also, does the "widespread aridity" mentioned for IS2 and IS4 mean desertic barriers or does it mean a mere decay of jungle ecology into savanna? It's all a matter of degree. From memory I have read about savanna conditions also before 60 Ka and never read anything specifically mentioning large deserts or semideserts (the Thar excepted). "This is best explained by expansion of C4grasses at the expense of C3plants at low latitudes during glacial periods when atmosphericpCO2was lowered". Yes, I think the extent of arid semi-deserts vs. grasslands is still not clear, but the pollen studies show that at times there were literally no trees (i.e., not a savanna in the common sense). I'll try to find some of the more recent pollen studies. Conversely, at times of savanna-like conditions, India could have of course supported quite large human populations, which seems to be reflected in the multitude of haplogroups originating from that general region. I am also quite certain that even from 25,000 to 55,000 conditions were cooler and dryer than today, and fairly variable. Maybe you're right about grasslands (prairie) instead of savanna, however I find difficult to imagine steppe so far south... unless it's indeed semi-desert. I'm not any ecological expert but aren't semi-deserts dominated by shrubs, which are normally C4 plants? "I am also quite certain that even from 25,000 to 55,000 conditions were cooler and dryer than today, and fairly variable". Erratum: "shrubs, which are normally C4 plants?" should read "shrubs, which are normally C3 plants?" The demonstration that I'm not any expert in ecology... hehe! For example, just arbitrarily take the green and above amounts of rainfall (>1000mm/year, roughly equivalent to the northern half of Portugal) as required for a lush plant and wild life. Then, during times when rainfall is only 1/2 of average (using today's numbers as a general proxy), you'll find that virtually no such zones exist, any longer (pink and above restricted to the immediate west coast). Even today, in much of India, agriculture depends on unsustainable usage of pumped well water. India's plant and wildlife is clearly highly susceptible to decreased rain amounts, as they occur when the Monsoon (that delivers the vast majority of rainfall) is even marginally disrupted. Still, deforestation reduces rain (tropical forests generate their own rain or almost) and maybe even more important is to understand monsoon in the Ice Age, which, if I'm correct largely depends on the Tibet plateau being heated in summer, what probably did not happen when it was under a thick ice sheet. Another important think is that Northern Portugal is quite rainy, not as much as the Cantabrian strip but this is one of the most rainy places in the temperate world (my English roommate is outraged: "woot, here it rains more than in London!"). In fact, the area with present day greatest rainfall in Central-East India, is precisely, excluding the Ganges banks, the area I mentioned as an apparent low density/late colonization area. So it's likely that people preferred something less humid or maybe more likely that the thick forest that rain would create acted as such partial barrier, much as the Congo forest in Africa. Can't say. It's a very complex matter but it certainly would seem as if South Asia has two halves: a wet one by the east and a drier one by the west. However DNA data (and to a large extent archaeological data too) suggest that people preferred the West to the East (only in general: riverine/coastal migration routes excepted). Ahem. Eurologist, I meant, of course. I just woke up and I'm drinking my coffee - may count as excuse, right? Ha, I need a couple of hours and a couple of cups of coffee to properly wake up, myself. Yes, the dryness was likely much more of a factor in the west and reaching into Pakistan and Afghanistan. I am sure there will be better and more extensive data available in the future - I just wanted to add a bit of this here so people (when thinking about AMH migrations and expansions) keep in mind that there have been significant climate differences over the past ~120,000 years, and not all of them pertain to extreme cold in the North.